“If you are looking for an amazing agent that would absolutely go to bat for you, I would recommend the Peg & Jeremy team. We just closed escrow on our home in Petaluma. We had a bit of back and forth with the seller and Peg & Jeremy really drove this to closure. Peg & Jeremy were on top of things - prompt responses, professional, and very much on top of every task during our experience. We wanted someone that we could trust would go to bat for us and they exceeded our expectations. They are very knowledgeable regarding Petaluma/home buying and recommended additional inspections where we found some issues that would not have been uncovered until a disaster were to strike after buying the home. Most agents would not have recommended the extra inspections. Now we have a plan to address. Additionally, they were very honest with us on homes we looked at - whether it would be right or not right for us. We started looking at homes this past summer and I did not expect for anything to happen so fast - here we are in September, we now have our home! We are very excited to start our new lives with our family in Petaluma. Thank you Peg & Jeremy for a great experience!” – Jen T.
“We would highly recommend using Peg and Jeremy King as your Real Estate Agent. We decided to move from San Jose to Petaluma and we needed help. 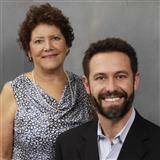 Our San Jose agent recommended Peg and Jeremy. We immediately enlisted their expertise. They are very professional, flexible, knowledgeable, friendly, accountable and prompt. We bid on 3 homes and hit gold on the 3rd try. We couldn't be happier. It was comforting to know they have been through many, many real estate transactions and kept us in the loop throughout the whole process (even while we panicked). Do not confuse their easy-goingness with lack of aggressiveness. They were willing and capable to do more than needed to make a deal happen. It was so nice to know they were OUR advocate! The whole process was a great experience. We used Peg & Jeremy's loan contact, handyman, house cleaner, and will continue to ask for advice in this wonderful town of Petaluma.” – Fred D.
“Peg and Jeremy helped us buy our first home in Petaluma. They were excellent to work with, very responsive and knowledgeable. They understood what we were looking for and didn't waste our time with the wrong type of property. They supported us in our offer on the house but didn't pressure us at any point into the sale -- just offered their honest advice and professional perspective. We would highly recommend Peg and Jeremy to prospective homebuyers in Petaluma!” – Emily B. “Plain and Simple, Peg and Jeremy are AMAZING! As a first time home buyer who really didn't know much about buying a home, they made this process so easy. They took on all of the stress so I wouldn't need to. They also offered a referral to the best loan guy ever! I would recommend this team to anyone looking to buy or sell. I do not believe you will find anyone better suited for this job, truly a blessing!” – Tiffany N.
“Many thanks go out to Peg King and Jeremy King for their amazing support during the sale of my father's home in Petaluma. Coldwell Banker is blessed to have these folks. I never had anything to worry about during this process and Peg always made sure everything was taken care of even if I was unable to be on site. It was a true pleasure working with them and do not hesitate to reach out to them for all of your RE needs!” – M.M. “Peg & Jeremy represented us in both the sale of our existing house and purchase of our new home. They were incredible professional, supportive and knowledgeable. They sold our existing home within a week, which is testament to their knowledge of the market and their marketing abilities. We would recommend them without reservation and, though we plan to stay in our new home for many, many years, there is no one else we would trust to sell our home!! They are a delight to work with!” – Jennifer P.
“We were so happy to finally find Peg and Jeremy King! We went through too many agents before getting to them - we wish we had started out working with them from the very beginning! They were very professional and put up with all of our first time home-buyer questions, as well as had an extensive list of suggested inspectors, contractors, carpet-cleaners - almost anything we could ask for! We highly recommend them for their professional, kind, genuine and family-friendly style. They helped us get through a couple of unusual and tricky situations to purchase a home that we're thrilled to own. Thank you Peg and Jeremy!” – Ariana R.
“Peg and Jeremy King helped us to buy our house a couple of years ago and we couldn't have been happier with the outcome. So when we needed to sell that same house due to a military transfer, we knew exactly who to call. Peg and Jeremy make you feel like you are a part of their own family, forget about being their client! I swear we could have been their only clients with how rapid my responses were and how on top of everything they are! It's obvious why they are voted the best Realtors in Petaluma and will continue to be with the amazing service and professionalism they provide. If you are looking for a great team to help you buy or sell your home, look no further! Peg and Jeremy King are the best!” – Dena V.
“We wish to thank Peg & Jeremy King for the excellent service they provided us over the past few months. They made the experience with both our houses so much easier. Both of them truly deserve the many compliments and accolades they have received over the past number of years. We would gladly use their services again and would highly recommend them without reservation.” – Rick S.
“When we decided to buy a home in Petaluma after several years of renting, we knew we wanted to work with someone who had deep knowledge of both real estate and the Petaluma market. Peg and Jeremy delivered on both fronts! We didn't expect it would take us an entire year to find the right place, but Jeremy patiently worked with us as we sifted through neighborhoods, checked out different types of houses to figure out what would suit our needs, and wrote several offers. He and Peg and their office staff worked together to answer our questions and show us properties quickly -- essential in a market with so few available homes. When we landed our dream home, we were so grateful to have Jeremy and Peg's guidance on pricing, negotiations, and even assessing renovations. Their knowledge and experience in Petaluma translates into a solid understanding of the pros and cons of different areas and houses, and great relationships with realtors and service providers all over town. Throughout the process, we have recommended Peg and Jeremy to other friends, and will continue to do so in the years ahead!” – Julie P.
“I followed Peg and Jeremy's successes for several years before listing my home with them. I liked the fact that they lived locally and knew the market well. They were very professional and knowledgeable. I would not hesitate to recommend them to handle what is a very personal experience for most people.” – Judith C.
“I would highly recommend Peg & Jeremy King for your Real Estate agents. They excel in marketing your home. They kept me informed through all phases of my home sale and went the extra mile. Just good folks who truly understand their business.” – Mark S.
“Before we embarked on our first house hunt, we overheard some lucky words: "If we could have done one thing differently on our house purchase in Petaluma, it would have been to hire the Kings." We took this inadvertent advice to heart, and when the time came, we didn't dither when choosing agents. Happily, those words were right on, as our experience with Jeremy King was stellar. He is personable, funny, sharp, punctual - and also incredibly experienced, with keen observations and timely advice that ended up, I have no doubt, playing a large role in us winning our house. Now that I have been through the process of buying real estate for the first time, I see how much of the agent's work is building relationships - with the area, the houses as they change owners over the years, the other agents, and of course the clients. There is just no substitute for that experience. We are so happy with our new home, and we are grateful that the process of acquiring it was so pleasant and remarkably smooth.” – Francesca P.
“Peg and Jeremy king are rock stars in my book!!! Not only did they help with the purchase of my home they were also very helpful in giving info on the sell of my home even though they had nothing to gain but giving peace of mind. Would recommend them to anyone!! !” – Michelle T.
“My realtor from Texas recommended Peg and Jeremy King when I started looking for a house in the Sonoma area a couple of years ago. Jeremy gave me a great rundown on the whole area, and Petaluma in particular, continuing to send me listings until the perfect house came up. Jeremy was able to help me get into a contract and get all the inspections and paperwork done in less than a week so I didn't have to make multiple trips into town. He also provided excellent recommendations for various services (also all good companies and people) so I could get all the work done I had asked for within several days of the close. Peg and Jeremy have been very attentive to my peculiar needs, and have made a complicated process so easy I'd be happy to go through it all over again!” – Craig S.
“When my long-time tenant suddenly moved out of my Petaluma house, I was faced with two bad choices: try to get another tenant or sell the house. Even though I preferred the second option, various commitments would prevent me from flying out to CA to deal with the house for at least a couple of months. When I called Peg, she cheerily told me there was no need for me to leave home--she would take care of everything. And indeed she did. She and Jeremy kept me in the loop at all times as they had windows replaced, new carpeting installed, fresh interior paint applied, new hot-water heater installed, etc., not to mention various minor repairs, major cleaning, yard clean-up, and landscaping. The property was ship-shape and ready for showing in about a month. The house sold quickly and painlessly, and my input in the entire affair was minimal--a few emails, phone calls, mailed checks, and documents signed online. This was extraordinary service from a terrific team, and I recommend them unreservedly.” – Alan M.
“Peg King was my Realtor when I bought my first house in Petaluma in 2000. After six months of looking (with Peg staying very patient), I was finally ready to put an offer on a house. Peg expertly guided me through the process and helped me secure the house (even with multiple bids). When it came time to sell the house this year, I had no hesitation in calling Peg. I no longer live in the area so I needed someone I could trust to handle whatever issues came up, including the transition from the rental property manager. Peg, Jeremy and the staff smoothly handled the sale. Communication was clear and consistent and the majority of the paperwork was handled electronically. I would highly recommend Peg!” – Shannon O. “I bought the home I just sold through Peg and I would think of no one who could better represent me when I sold it. The first time price I paid was less than the asking price in an inflating market. When selling, I received more than I anticipated. She is a great negotiator, a professional and will stay with you from start to finish. What more could a buyer or seller ask for. Thank you Peg!” – Merle M.
“We've known Peg now for 16 years. She helped us buy our first house in Petaluma in 1997 and has represented us in 4 additional transactions since then. She and her son Jeremy are knowledgeable about the local market and other agents, strategic in helping plan out a bid or sale process, and have never failed to understand our goals in a transaction in order to help us meet them. Best of all though is that Peg and her family are absolute sweethearts who will work incredibly hard on your behalf and make sure you are well taken care of in the process. Her husband Cliff even made us dinner multiple times when we were first looking and had to drive in from out of town! Call Peg and Jeremy - you can't go wrong.” – Fred V.
“We were relocating from Washington DC. Peg and Jeremy worked with us for over a year to find the perfect place. They facilitated all the paper work and assisted in the inspections and final walk through. They exceed all our expectations and continued to assist us following closing. A great team!” – Bonnie A. “I am very grateful to Peg and Jeremy King for their assistance in selling my fathers home after he passed away. They were helpful in giving our family direction on how to prepare the home for sale and equally helpful in analyzing this difficult market so that we would sell the home at a fair price. Their recommendations resulted in a sale within two weeks. Quite remarkable. It was a pleasure to work with such professionals that are also very good people. I highly recommend this team. My experience and satisfaction only reinforces why they are "Top Producers" in the Bay Area.” – Steve G.
“I wanted a real estate agent that I could trust. I wanted someone who had been in the business a long time and who had good relationships with other agents, lenders and title companies. I found this with Peg King and Jeremy King. I have sold one house and bought two townhouses and all three transactions exceeded my expectations. Communication between us was easy and prompt. It was because of their expertise in the industry, we were able to negotiate a fantastic deal on our latest purchase. They started out as my real estate agents and turned into people that I trust and deeply care about. As a surprise, much later, when it was close to tax season, I received documents in the mail from them that I would need, which saved me the time and energy of locating them in my files. They are true professionals with warm, friendly, caring personalities.” – Joanne J. “Peg and Jeremy sold our home in Petaluma. We received multiple offers within a month of listing with them, having previously listed the home and gotten no offers. Their advice was spot on for pricing and marketing. The marketing, including brochure and website, were absolutely beautiful - made me want to keep the house! They are extremely knowledgeable about the Petaluma market. I would definitely use them again. Thanks Peg and Jeremy!” – Dana M.
“We recently sold our home as well as another residential Country property. As our agent Peg King was the listing agent for both properties. She was extremely professional throughout the process. The marketing was excellent and she brought qualified buyers . In both cases the Escrows were complicated and Peg was very Patience and helpful through the close of escrow. I highly recommend her and would work with her again sometime.” – Del S.